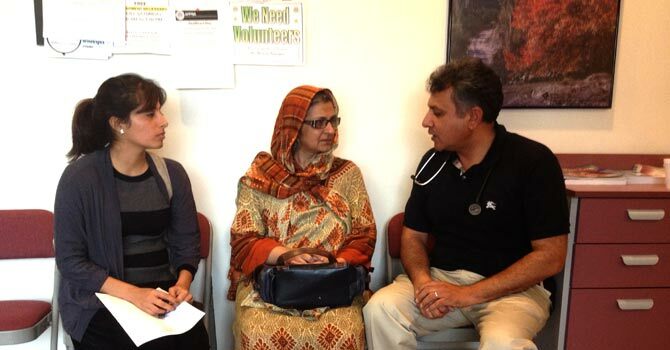 The Pakistani Descent Physician Society of Illinois (PPS), under the umbrella of the Association of Physicians of Pakistani Descent of North America (APPNA), opened this free health clinic in 2009. APPNA, which has been in operation for 35 years, is headquartered in the Chicago suburb of Westmont, Illinois and has brought together motivated doctors sprinkled throughout the United States to volunteer at free clinics, perform charitable acts, and has also provided assistance in times of dire emergencies when natural disasters hit both the US and Pakistan. Open on Saturdays due to its nature of being run by volunteer physicians, medical students and community members who have other responsibilities during the week, the clinic caters to about 25 patients on a given day in the four hours it is open. With an increasing demand from the patients, PPS hopes to gain more support to start a mobile clinic and also begin providing services on Wednesdays in the future. The clinic is open to all and not just the South Asian community of whom approximately 40 per cent are without health insurance. While, almost a fifth of the entire population lives without it and has to rely on government-assisted methods or do without proper healthcare altogether. For Dr Khan, the paid work he does during the week does not come close to the satisfaction he feels when a patient thanks him at the end of a consultation. PPS, with its network of providers is rendering services worth $250 million a year to needy patients.